Welcome to the West Lancashire Fencing Club website. 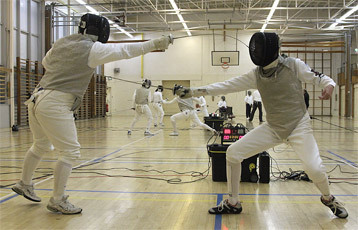 If you are interested in having a go at the Olympic sport of fencing, we are running five-week beginners courses starting on Wednesday 30 January 2019 and Wednesday 13 March 2019. These sessions will be held during our Wednesday Club nights in the Gym at Edge Hill University in Ormskirk between 8pm and 10pm. There is a minimum age of 12 years. Why not come along and try this most dramatic of sports? To sign up for a session or to obtain further information, go to our Taster Sessions and Beginners Courses page. If you can't make it on these dates, contact Stephen Hodges by e-mail at Stephen.Hodges@westlancsfencing.co.uk so that we can keep you informed about new dates. If there is a group of you (5 or more), we may even be able to organise an exclusive date for you all!